The yard is still green.. 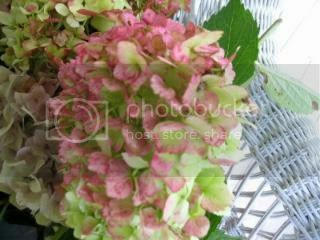 The hydrangea blooms have turned their pink and green color, so they have been cut to be dried, and sprayed for flower arrangements.. 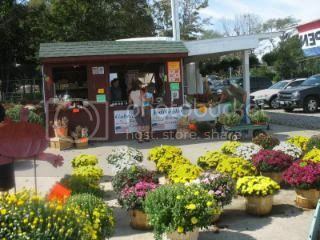 I will show those in another post..
A trip to the North Fork..many farm stands for fruit and vegetables, corn mazes for the kids, and mums.. 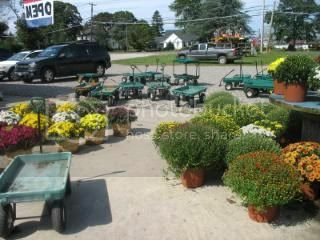 Grab a wagon and fill it with pretty mums...4 big pots fro 10.99..a bargain in this area.. Some peaches or apples for a pie..or some fresh corn for dinner?? Some peach pie for you??? It's the first time I made peach pie, I have to tweak the recipe.. Thanks for coming, see you for Tablescape Thursday? 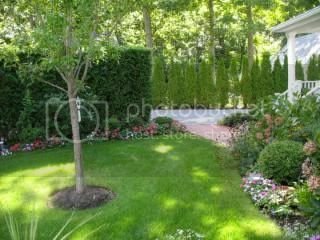 Gorgeous yard! Relaxing spot. 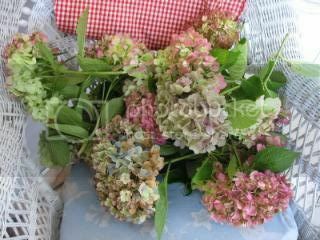 I have never clipped hydrangeas to preserve them. I look forward to the next post! It's still pretty green here, but today seemed like the first day of fall after quite a few days of over 100 degrees. I can't wait to see the leaves start to change. Your yard is so pretty. 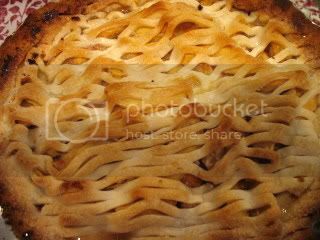 Once you tweak that peach pie recipe be sure to post it, love peach pie! Please stop by soon, take care. Sure is pretty in your neck of the woods, Kathleen. Those hydrangeas are gorgeous! as are the mums...What a good price, too! It's not very fallish here yet, either, K. Cool in the mornings and evenings but still hot up in the day. 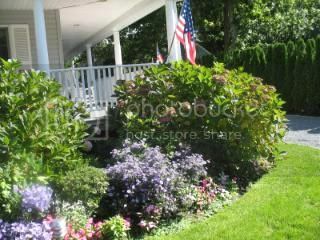 Your lawn and gardens look great. You have a beautiful home. I would kill to raise hydrangeas but it's just not the right climate around here. Beautiful post. It is still green here as well but the first frost should be here soon. I will have to try a peach pie. Let us know when you tweak. Fall is here in Ohio, that is for sure. In the forties last nite! crisp clear weather, finally... I love it. Kathleen your yard is still so very gorgeous. I love the pinks in your hydrangeas and remember when you sprayed them gold for an anniversary party. 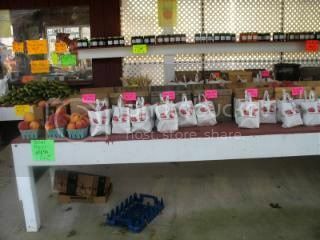 The peak at the farm stands is so fun - nothing like that in our rural area. The price on those mums is a bargain - I just looked at some in our area last weekend and they were $15.99 for one basket! Your yard and the hydrangeas are gorgeous. but the pie.... Oh my, it looks yummy! Still looks great! The hedge has grown so much! Your garden beds are just brimming with color still. Our area is very green to but I do live close to a rain forest area. I do love the fall though. What a gorgeous yard you have! Lucky girl. It was fun to visit all the places YOU visit. Thanks! I love your yard. 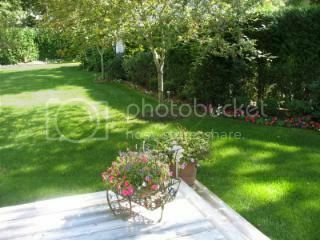 The plantings are so pretty and it is so well manicured, yet inviting. We are still green as well. Your photos are lovely. I hope you are having a wonderful day. I don't know where you live, but I sure do like the idea of 4 pots for 10.99. I love to look at you tables and your pie look great to me. You have a beautiful yard. Love your porch. Looks like a great place to relax. Love peach pie! It's greener than summer was here, due to less extreme heat. Wonderful to have flowers again! Your yard is so pretty! I love your new fall look! Your yard still looks like summer, though, and oh, so pretty. That is a great price for mums! I've never seen them that low here. I've really been enjoying peaches lately and your pie looks wonderful. What needs tweaking? I'm going around trying to catch up. Birthday celebrating was fun. No mishaps!! How is the broken collarbone healing? It's still very green here, too. And we still having to mow the grass weekly. Great price on the large mums.... I'm looking forward to seeing what you do with your mums. And I'm surprised that you had never made a peach pie before. I bet it was yummy. What a perfectly manicured yard. I love hydragenas and using them dried in arrangements. . . just hard to beat. Have an incredible and blessed week. That is a great price for mums. I won't even tell you what we're getting!lol Your yard looks amazing. How do you have time after cooking and decorating so much? hubby was just mentioning we should go to Long Island soon. I'll have to check out the wineries to go to. Your early fall garden looks lovely!